Intergroup interactions in primates vary from nonagonistic to severely aggressive. Food resources and fertile females cause intergroup aggression when groups defend resources and mates from other groups. Peaceful intermingling during intergroup encounters is rare but has been reported in several primates, including bonobos (Pan paniscus). Although intergroup encounters in bonobos occur at both nonprovisioned and provisioned sites, provisioning may be one factor responsible for frequent intergroup encounters. 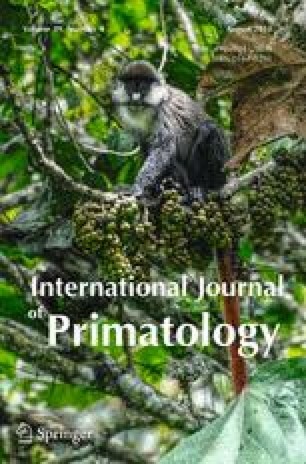 We studied intergroup encounters between one bonobo group (PE) and its neighboring groups, one semihabituated and two habituated groups, under nonprovisioned conditions in 2010–2015 at Wamba, Democratic Republic of Congo. We examined whether fruit abundance and females with sexual swellings influenced encounter frequency. PE group encountered the other groups on 7.1 days (mean, range: 0–19) per month. Up to four different groups met simultaneously at one location. Encounter frequency was highest around the yearly peak in fruit abundance, suggesting that reduced food competition is linked to increased encounter frequency. During periods of relatively low fruit abundance, the probability of an encounter was higher when a higher number of adult females with maximum sexual swellings were present, suggesting that the attractiveness of females with sexual swellings promoted group encounters during periods of relatively low fruit abundance. These findings suggest that both competition for food and the availability of females with sexual swellings influence encounter frequency in bonobos. The online version of this article ( https://doi.org/10.1007/s10764-018-0058-2) contains supplementary material, which is available to authorized users. We thank the Ministry of Scientific Research and Technology, DRC and the Centre de Recherche en Ecologie et Foresterie for research permits and scientific collaboration. We also thank local assistants at Wamba, members of the Wamba Committee for Bonobo Research, and the Primate Research Institute (PRI) of Kyoto University for assistance. We are grateful to Dr. T. Matsuzawa, Dr. H. Hirai, Dr. T. Yumoto, and Dr. G. Idani for their continuous support. We appreciate Dr. M. Mulavwa’s and the late K. Yangozene’s efforts on the habituation of neighboring groups, and would like to express our gratitude to Dr. E. V. Lonsdorf, Dr. J. M. Setchell, Dr. M. Nakamura, Dr. A. MacIntosh, and five anonymous referees for useful comments. The study was financially supported by the Japanese Ministry of the Environment Global Environment Research Fund (D-1007 to T. Furuichi); the Japan Society for the Promotion of Science (JSPS) Grant-in-Aid for Scientific Research (26257408 and 22255007 to T. Furuichi, 25304019 to C. Hashimoto, and 16H02753 and 25257407 to T. Yumoto); the JSPS Core-to-Core Program (2009–2011, 2012–2014, and 2015–2017 to T. Furuichi); the JSPS HOPE Project of the PRI of Kyoto University (to T. Matsuzawa); a US Fish and Wildlife Service Assistance Award (96200-0-G017 to African Wildlife Foundation); a Ministry of Education, Culture, Sports, Science, and Technology in Japan Special Grant (“Human evolution”); and the JSPS Strategic Young Overseas Visits Program for Accelerating Brain Circulation (S2508).